Mimaki Engineering Co., Ltd. (Mimaki) announced today that it has attained the "ECO PASSPORT" certification from OEKO-TEX® via Nissenken Quality Evaluation Center, for its "Sb54/310/410" and "Sb320/420", sublimation inks. The "ECO PASSPORT" authenticates the safety and security for chemicals used during the production of textile dyes / pigments and auxiliaries and finishing agents. 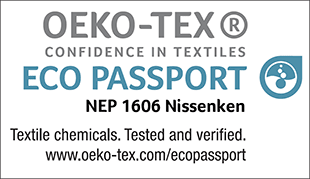 It was set up by the OEKO-TEX® international association headquartered in Switzerland, as an effort to prove the safety and security intended for the materials (used chemicals) following to the [STANDARD 100 by OEKO-TEX®] (*1), being target for the safety and security of textile products. Applying of the safety certification in Japan, in June 2016 through Nissenken began and this certification of safety for the materials likely to contain the harmful substances will improve the safety level of the overall of textile products. Mimaki took the lead of the market to develop ink, ink-jet printer industry to reduce environmental impact. Especially the sublimation printing is becoming attractive as its environmental-minded system. Because printing by the sublimation ink does not need the "steaming" nor "washing" as the post process after print. Moreover, the sublimation print will not require the cleaning process of screen nor the waste water treatment, neither, the chemical matter like emulsion which is necessary in the process of screen print. As well the introduction of sublimation print can be started with a low cost, not only a production area as factories also a Fab (fabrication) space etc. familiar with the general consumers is increasing to start to enter the system. While there has been a growth of awareness of the safety and security of textile products in the recent years, Mimaki gained the "ECO PASSPORT" authentication for the certificate and safety at world level by 3rd party agencies in the segment of sublimation ink "Sb54/310/410" and "Sb320/420" for our valued customers use of Mimaki products with confidence. (*1) [STANDARD 100 by OEKO-TEX®] is a certification system for the safety and the security of textile products. It is a universally-accepted standard proving the absence of harmful substances, such as the aromatic amines, in textiles and its related products. Developed in 1992, OEKO-TEX® is the first system proving the safety of textiles in Europe. Other than the 15 European countries, Nissenken is the exclusive certification authority in Japan. Certifications cover each stage of raw materials, product and company environment. The [STANDARD 100 by OEKO-TEX®] product certification has a history over 20 years, boasting more than 150,000 recipients in the world. It also satisfies specific criteria in other countries as well, such as the Azo restriction in Japan. Because the [STANDARD 100 by OEKO-TEX®] calls for the certification that can meet the over 300 target harmful substances to be certified.